The man who could be in charge of ensuring the safety of the nation’s drinking water doesn't know the most basic fact about a grave health threat for American children: lead contamination of tap water. Among scientists and public health officials, there is no debate that there is no safe level of lead exposure. Any exposure can harm children’s brains and development. 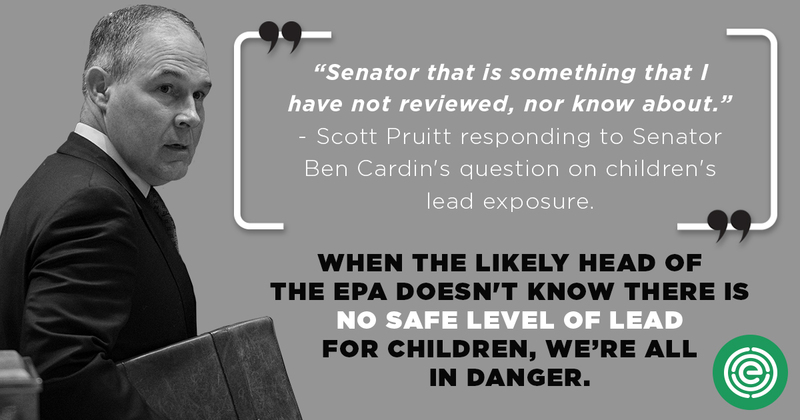 Pruitt, the attorney general of Oklahoma, should know this, given his home state's long history with lead contamination, most notably from Tar Creek – a former lead and zinc mine that is now a Superfund cleanup site. EWG’s analysis of data from the state Department of Environmental Quality shows that more than 10,000 Oklahomans live or work in communities with current violations for lead in drinking water. In 2014, the rate of children testing positive for elevated blood lead levels in Grant County, Okla., was among the 10 highest counties in America. The drinking water crisis in Flint, Mich., brought renewed attention to the dangers of lead exposure, but the threat is national. The Centers for Disease Control and Prevention estimates that more than half a million children have blood lead levels higher than the action level at which the CDC recommends that doctors and local or state health agencies provide additional care. If Pruitt is confirmed, one of his most important responsibilities will be to oversee a drinking water action plan drafted by the Obama administration, including proposed revisions to the EPA’s Lead and Copper Rule. That's not a responsibility that should be entrusted to someone ignorant of the facts about lead.